I cannot grasp the fact that it is November. Thanksgiving is only a few weeks away, and Christmas is just on its heels, which frankly seems implausible. I have no idea where 2014 went, but my brain seems to still think we're in July (although I will say that the weather has turned down ever so slightly, and you will be pleased to know that I am wearing a sweater as I type this). Fall...I love you. In any regard, in a few short weekends we will be celebrating our annual Friendsgiving, which is always the best excuse to stuff yourself to near oblivion, get borderline drunk and pick cranberries out of your kids' and your friends' kids noses. It's truly a heartwarming experience, and I'm not lying when I say this. This year we are also saying farewell to two of our dearest friends, Scott and Rema, who are catching a flight to Sydney later this month and unpacking their bags for the better part of three years. I am a mix of emotions about this. Terribly sad that they are leaving because I will miss them like crazy, secretly giddy because I am already plotting our trip to Sydney next year, and a trifle trepidatious about their well being amongst crocs and sharks and box jellyfish. Eeeps! By the way, have you read this book? You just must. What are your plans for the holiday this year? Are you traveling? Staying home? I'd love to hear! 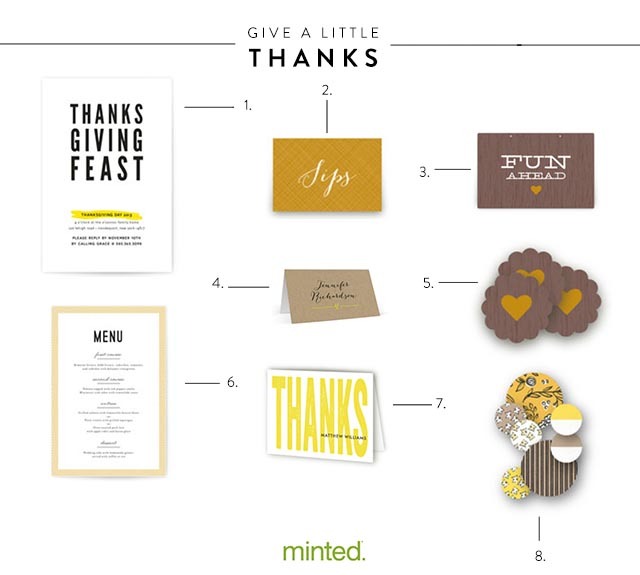 Be sure to check out Minted for your party decor. This decor and the invites are so cute! I love Minted! We are visiting our families, but one year I'd love to host. You're the sweetest :) We'll be anxiously awaiting your visit next year! And I'll arrive at Friendsgiving with tweezers to help with the cranberry plucking!